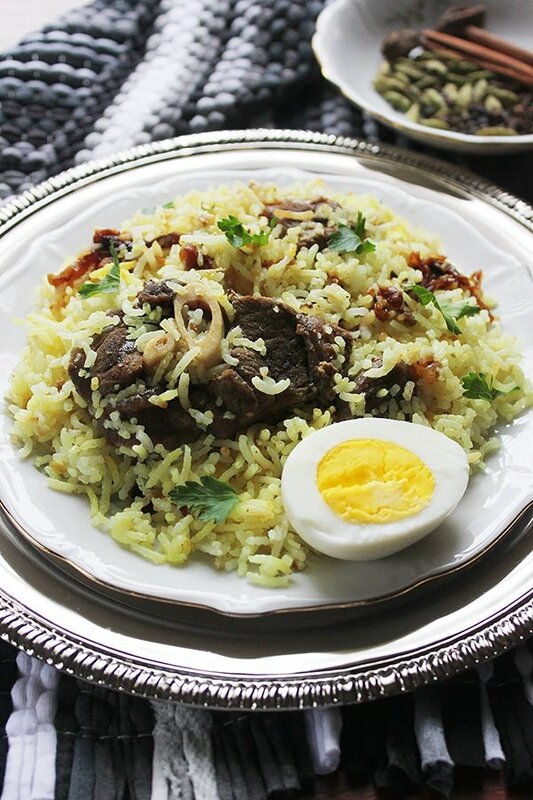 Lamb Biryani Recipe is one of many biryani recipes in India. I love Indian food, and that’s no secret, I love the spices they use and the way they cook. It’s amazing how one dish like Biryani can have more than 20+ versions, and they all taste great! There are many states in India, and each one proudly created its version of biryani, be it chicken biryani, lamb, fish, or vegetable you name it, and there is a delicious version waiting for you to try. 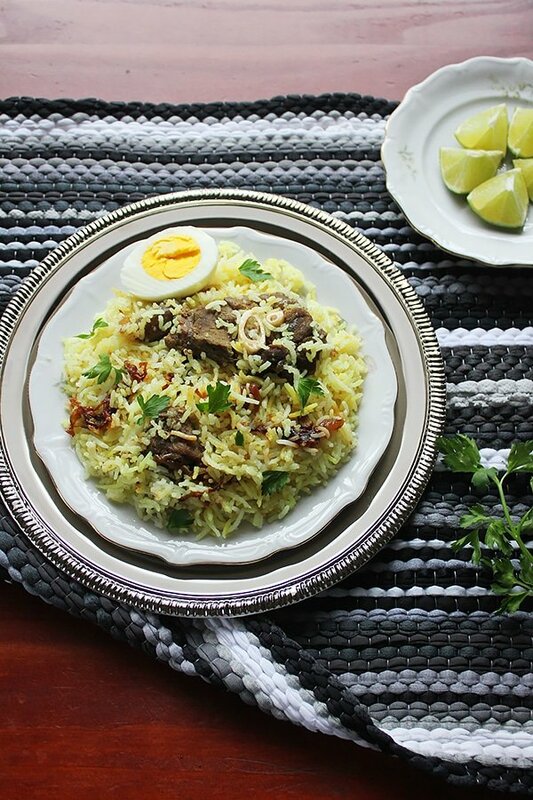 In this biryani recipe, I’ll be using a pressure cooker, which I used to have a love-hate relationship with, but everything is cool now, and we are friends. Having a pressure cooker will cut your cooking time in half, so I do recommend that you have one unless you’re uncomfortable or afraid to use it (like how I used to be.) You can, of course, cook the lamb in a regular pan, but you will have to cook it on medium heat for about one and a half to two hours. 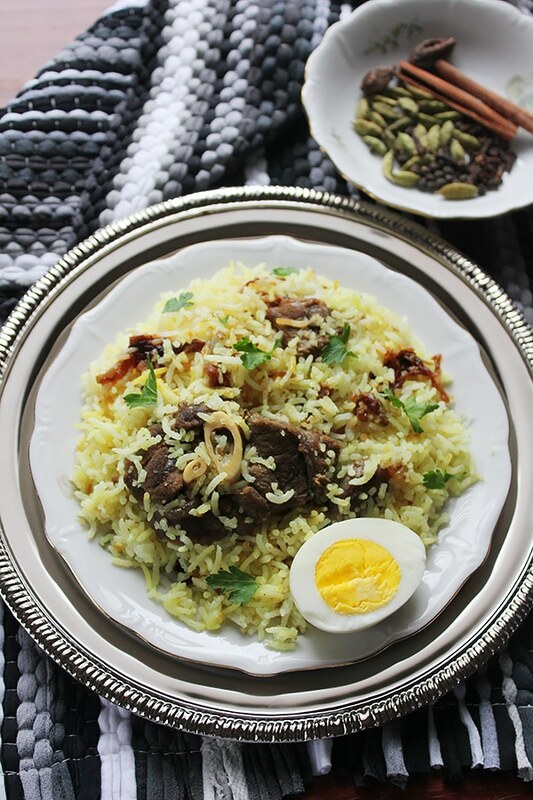 This Delicious Lamb Biryani version is what I usually cook since it’s NOT loaded with raisins and fried nuts, it’s pretty plain and simple. 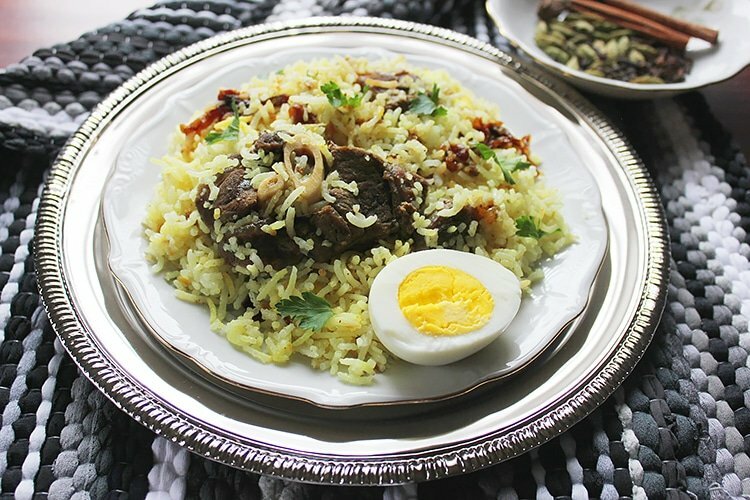 HOW TO MAKE LAMB BIRYANI? Please don’t be scared when looking at the long ingredient list; it’s all spices that you add at one time over the meat! In a big bowl add the meat and all the marinade ingredient, mix well and cover. Place the bowl in the fridge and leave it for 30 minutes to an hour. In a pressure cooker, add all the marinade and the meat. If the marinade is not covering the meat, then add a little water, enough water to cover the meat. 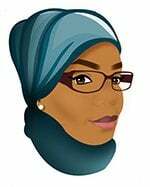 Close the pressure cooker and place it on high heat until you hear a whistle. After the first whistle, reduce the heat to medium and cook for 30 minutes. When using a regular pan to make this mutton biryani, then follow the same steps and cover the pan, let the meat cook for one and a half to two hours, but you have to occasionally check if the meat needs more water and stir to avoid it sticking to the bottom of the pan. Caramelize the onion and make sure not to burn it or it will leave a bitter taste in the biryani, so keep a close eye. Cook the rice separately, and here we come to the last step of assembling the lamb biryani. 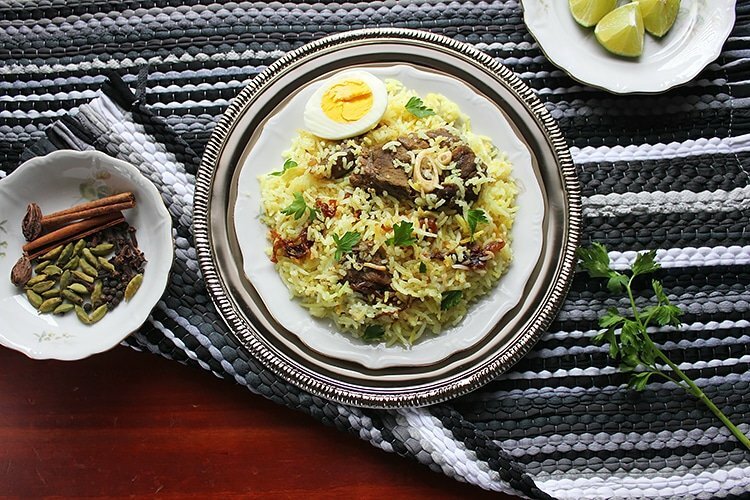 Lamb biryani always bursts with flavor, and all that flavor comes from cooking the lamb with the bone and the spices. As you can tell, there are many spices used in making biryani but that shouldn’t scare you, the steps are simple, and the spices go all at once in the marinade. The spices here are warm and aromatic, combined they give out an amazing taste that stays with you for a long time. Cumin, cinnamon, cardamom, clove, red chili, anise seeds, black pepper, turmeric, and star anise are all the essential ingredients. Besides this list, we get to have more flavors coming from the ginger and garlic too! HOW TO TENDERIZE THE MEAT? In biryani, the flavors reach the bone of the meat, which means every bite you take screams deliciousness and for that to happen the meat has to be tender. The older the lamb, the tougher the meat but when you buy it there are chances that your butcher won’t be 100% honest with you about the age of lamb. There are many ways to tenderize the meat, and these methods are used in Indian cooking. Yogurt: The acidity in the yogurt helps the meat to tenderize, therefore in some recipes, the meat is marinated overnight. 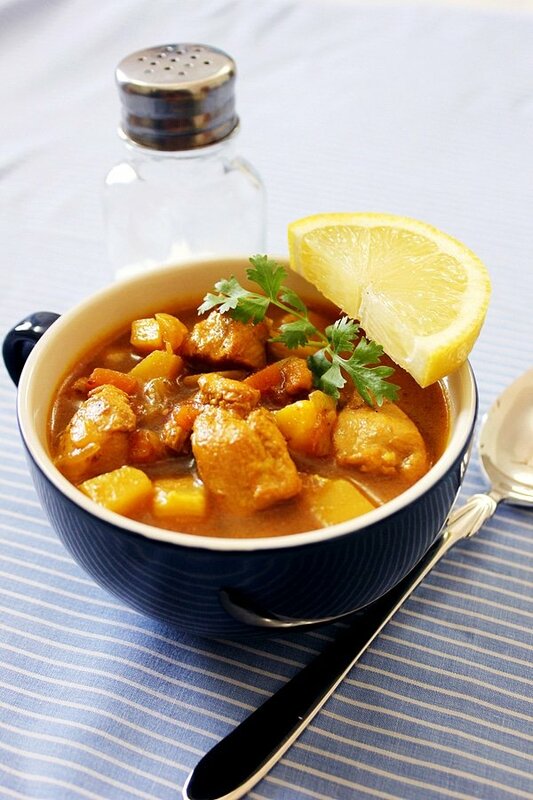 Lemon: Although it helps in partially cooking the meat while its marinating, you can’t use much of it otherwise it will affect the taste of the biryani. Papaya: It is a fruit, and it contains papain which works amazingly to tenderize meat, and mostly in India they use it for that purpose. Pineapple: It can be used if Papaya is not available, bromelain is an enzyme found in pineapples, it digests protein and softens the meat before cooking. Slow cooking: Slow cooking any cut of meat makes it tender, so if you have time and can’t get your hand on any tenderizing agent, then cook the meat on low heat. This Delicious Lamb Biryani is one of my favorite Biryanis since it’s not loaded with raisins and nuts, pretty plain and simple. Marinate the lamb in all marinade ingredients, mix well, cover, and keep aside for 30 minutes to an hour. Transfer the lamb with the marinade to a pressure cooker. Cook for 15 minutes, there will be water from the lamb and yogurt, the water released should cover the lamb, if it didn't then add enough water to almost cover the lamb. Cover the pressure cooker, and let it cook on high heat until you hear the first whistle. Reduce the heat to medium or number 3, let it cook for 20 minutes. Do not open the pressure cooker until all the steam is released. In a pan, add water and rice spices, let it come to a boil. Add the rice, and let it boil for 9 minutes. Drain immediately. Fry the onion in the butter and olive oil, until it is brown in color. When brown add the water and let it boil until half the water is evaporated, add the turmeric. Turn off heat and keep aside. Add 1/4 of the rice to the bottom of a pan, add the lamb with a ¼ cup from the sauce. Add half the caramelized onion on top of the lamb. Add the rest of the rice on top of the lamb, add the rest of caramelized onion on the rice. Cover the pan tightly, and let it cook on lowest heat for 15 minutes. Turn off heat. After 10 minutes and by using a large spoon gently mix the rice and the lamb. You can cook the lamb on low heat Ai and still enjoy this Biryani 🙂 .. I agree that pressure cooker is hard to love in the beginning! This dish looks absolutely delicious, and beautifully presented! So many delicious flavours! It sounds and looks like a perfect dish for the lunch! I’ve tried Lamb Biryani in an Indian restaurant before, it was delicious! Yours looks so yummy! Biryani sounds incredible! Especially because of the lamb! YUM! This looks so good!